Completely cover and Saturate the concrete well, but not so much as to cause it to puddle. Work in sections, from wet edge to wet edge. Do Not walk in wet stain as it will cause footprints. Work your way back and out. Ensure you have a towel or a place to remove your shoes when leaving the project area to prevent accidental tracking onto unintended areas. If you choose to brush the stain, such as for borders or multiple colors, be sure to use a soft bristle brush, in a circular motion, to avoid back and forth straight line brush marks. If you intend to brush the overall area during staining, then it will need a second sprayed only coat to help hide any brush marks. You should only brush the first coat and then spray a second coat. You can either back spray as you go, or you can allow it to dry and spray a second coat. When doing multiple coats or highlighting, there is no need to wash the residue between coats, just allow it to completely dry before walking out and applying more. You can do highlight coats with the same or a darker color, by holding the sprayer wand higher up and raising and lowering the wand as you go, or by just misting. TIP: You can apply a single coat of Pro-Etch stain over Artist Grade to highlight, darken or color tone shift. 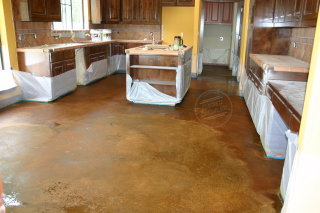 When doing old and new concrete sections together, stain it all and then do additional coats on the lighter sections to help blend them in with the darker sections. 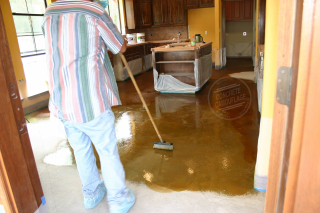 The stain reacts with the concrete during this time to achieve the final color it will become, and a light powder residue forms. Some colors have more residue than others. 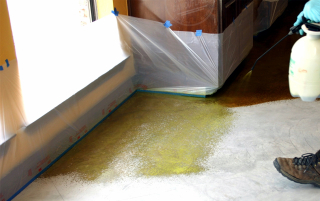 The stain needs to sit dry for at least a few hours before neutralizing and rinsing. The longer the stain sits, the darker and richer the color becomes. Riverstone and Weathered Wood has the best chance of achieving lighter grays when neutralized and rinsed after only 3 or 4 hours, where the other colors do best when allowed to sit overnight or longer. While you can leave the stain on longer than 24 hours if you need to, it's pretty much reached maximum reaction at 24 hrs.